No, not the St. Paul from the Bible, the greatest of the Apostles, who was converted on the road to Damascus. The city St. Paul on the Mississippi river in Minnesota. One of the Twin Cities, along with Minneapolis. That’s where I was born back in late December of 1952. So this post is just some stories of where I got started, and some early memories and influences. So I was raised by Indians in a garden where there were huge thunderstorms and we ate White Castle hamburgers. I guess I should clarify that. I was baby number six for my parents, after one girl, one boy, and then three girls. Since I was a baby boy (instead of one of many girls), I became my Mom’s favorite. You can just ask my siblings about that. When I came home from the hospital, my Mom now had a newborn, a one-year-old, a two-year-old, a five-year-old, a six-year-old, and a ten-year-old. It was too much. She reached out to the church and she was connected up with a home for abandoned (perhaps troubled) girls. She chose a 16-year-old Indian girl named Jeri to come and live with us and help with the children. Evidently Jeri thought I was the cutest thing and carried me everywhere, to the point that they say I didn’t walk until I was two because I didn’t have to! Incidentally, to give you an idea of what times were like in the “mid-century” era, my parents had friends who would no longer come to visit or even associate with them because we had an Indian living in our house. The house stood on a double lot, and in the “side back” yard was a flower garden that had been started by the previous owner of the house. The flowers were peonies, but not just any peonies. These flowers had won first prize at the Minnesota State Fair several years running and they were HUGE! So my mother would go outside in the morning to weed the garden, and she would sit me down next to her under the flowers. So I was raised in a garden. My earliest memory is of that garden. I remember watching the earthworms in the black, soft dirt, and the ants on the flowers. My mother told me (probably much later) that the ants helped the peonies to open up and bloom, so we always left the ants alone. My first word was “flower”. My Dad worked for 3M as an engineer making magnetic tape, so we had a tape recorder even back then. I was getting a bath in the kitchen sink, my Mom floated one of the peonies in the water, and I said, “flower”. My Dad got his tape recorder to save the event for posterity, but to add some interest he took the flower away! I immediately started to cry and didn’t stop until he put it back. Maybe he had a bit of a mean streak. Unfortunately, we lost the recording in a fire we had at our house in the mid-60s. My Dad had an upright piano that he used to play and he’d sing old songs for us while we sat next to him on the bench to sing along. Also, our house had a big wraparound screened-in porch and we would keep a couch on it in the summer. Now if you’ve never been in the Midwest, you’ve never heard a real thunderstorm. I liked to sit out on the couch with the rain pouring out of the sky and listen to the huge peals of thunder echoing off the neighborhood houses. I wasn’t scared because my Dad told me that it was just the angels pushing a piano down the stairs. That made perfect sense to me, so to this day I love thunderstorms. I remember the first time I heard the hymn “How Great Thou Art.” The first verse captures what I feel in a thunderstorm. Then there is White Castle, the home of the Perfect Food. After church on Sunday we would sometimes trundle off to White Castle and get a “sack” (that’s a “bag” to you non-Midwesterners) of hamburgers and head over to Gramma Wanschura’s house. I was so impressed that I could eat four hamburgers! At the time you could get them “with” or “without” (onions). I think now they just make all of them with onions. Even then you could watch them make the burgers, which was really cool. It was located at “Seven Corners” in St. Paul but I couldn’t figure out if any of the current Castles is the one I ate at. There’s not one near me now which is probably a good thing since I would weigh another 100 pounds more. I do know where the nearest ones are, though (Howell, Eatontown, and Edison near the Menlo Park Mall). So if you’re near any of them, feel free to pick me up a sack. You’ve all heard this expression in one form or another: “Life is hard, and then you die.” I would like to point out a different perspective from a familiar Bible passage. Yea, though I walk through the valley of the shadow of death, I will fear no evil: for thou [art] with me; thy rod and thy staff they comfort me. David had a view different from that which is common in our cynical world today. Because he had a divine shepherd he knew that his experience would be one of goodness and mercy. If you read about David’s life in Samuel and Kings and Chronicles, you’ll see that his life wasn’t always rosy. He had to hide in caves from King Saul who was trying to kill him, his own son Absalom rebelled against him and tried to steal his kingdom, and because of David’s own sin his little baby boy died. Even in all this he knew that the Lord his shepherd was guiding everything in goodness and mercy. And where was it all leading? David knew his own death would only bring him to an even better place, to be right at home in the house of the Lord, forever. It seems to me that what David had is much better than anything contemporary society has to offer. To illustrate the difference, here’s a (perhaps a bit grisly) example. Imagine two people on the edge of a bridge. One is hanging on, about to fall off, and the other is a BASE jumper with a parachute. The first person would say, “I shall fall, no one will save me!” It is a description of what is about to happen as a matter of course. The BASE jumper would say, “I will jump, no one shall stop me.” This is a statement of intention, of the certainty that he will make the event come to pass. David doesn’t say that goodness and mercy WILL follow him, he says that they SHALL follow him, without any doubt. In the same way he is certain about what comes after this life is over. He doesn’t say “I SHALL” dwell in the house of the Lord, he says “I WILL” dwell in the house of the Lord forever. How does he know this? Because (see verse 1 in the psalm) he has the Lord as his shepherd. I have a Shepherd, one I love so well. How He has blessed me tongue can never tell. That I might ever in His love abide. Following Jesus ever day by day. Nothing can harm me when He leads the way. Jesus the Shepherd is my all-in-all! Having been raised as a Catholic, I never quite understood why we couldn’t eat meat on Fridays. I guess after Vatican II that was limited to Lent, and the rest of the year it was OK. Anyway, here’s some Bible food trivia. So the Biblical view is that it is OK to eat animals, but you don’t have to if you don’t want to. There was a certain rich man, which was clothed in purple and fine linen, and fared sumptuously every day: And there was a certain beggar named Lazarus, which was laid at his gate, full of sores, And desiring to be fed with the crumbs which fell from the rich man’s table: moreover the dogs came and licked his sores. And it came to pass, that the beggar died, and was carried by the angels into Abraham’s bosom: the rich man also died, and was buried; And in hell he lift up his eyes, being in torments, and seeth Abraham afar off, and Lazarus in his bosom. And he cried and said, Father Abraham, have mercy on me, and send Lazarus, that he may dip the tip of his finger in water, and cool my tongue; for I am tormented in this flame. But Abraham said, Son, remember that thou in thy lifetime receivedst thy good things, and likewise Lazarus evil things: but now he is comforted, and thou art tormented. And beside all this, between us and you there is a great gulf fixed: so that they which would pass from hence to you cannot; neither can they pass to us, that [would come] from thence. Then he said, I pray thee therefore, father, that thou wouldest send him to my father’s house: For I have five brethren; that he may testify unto them, lest they also come into this place of torment. Abraham saith unto him, They have Moses and the prophets; let them hear them. And he said, Nay, father Abraham: but if one went unto them from the dead, they will repent. And he said unto him, If they hear not Moses and the prophets, neither will they be persuaded, though one rose from the dead. But now I can’t deny it. God is, in fact, speaking to me, in a very direct way. Oh, I’m not hearing voices or seeing visions, but it is not reasonable to ignore the “messages” I am getting. After Jack closes the meeting with a prayer, we sing hymn #77 from the Gospel Hymn Book (see pic below of the page from the hymn book). 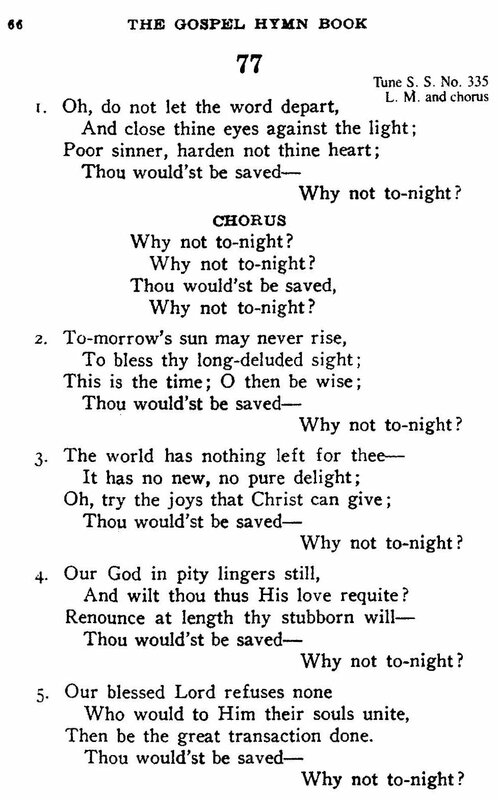 The tag line of the hymn is, “Thou wouldst be saved, Why not tonight?” and the “Why not tonight” tag line is set separately over to the right, so it appears five times. The thought is now my own. If I want to be saved, why NOT tonight? 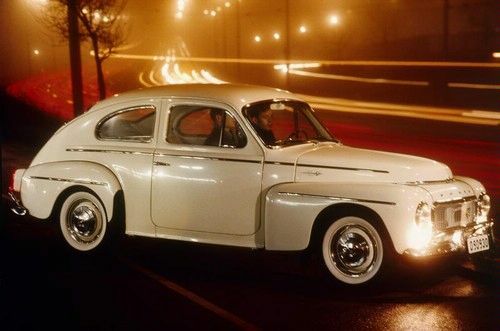 The meeting ends and my girlfriend and I get in her old 60’s Volvo (see sample pic below) to make the hour and a half trip back to UConn. I’m driving and I’m talking about my reaction to the day, especially the gospel meeting, while she sits quietly and lets me ramble on. I really want to tell her I’m saved now, but I know I’m not. And here’s the dilemma: I know I have three spiritual enemies: the world, the flesh, and the Devil. This is old information from my childhood which has been recently reinforced by the Christians I have met. I had already come to the conclusion that the world didn’t want me to be saved, as represented by my friends who were just like I had been, more interested in scoring some hash, LSD, and the occasional lump of opium. They were not going to help me with my eternal destiny, in fact, quite the opposite. So the world was out. As I’m talking, I realize that it’s Satan that is trying to get me to say I am saved even though I know I’m not. He’s definitely not on my side, so I reject the idea of lying about my condition. So Satan is out. And he does. Right there. In the drivers seat of that Volvo, somewhere on route 84 near Plainville CT at around 11:00 at night. God shows me that Jesus loves me, and when he died on the cross it wasn’t just for “everybody” or for “all the sinners,” it was for ME! He saved me! I’m saved! I turn to my girlfriend and say, “I’m saved! God saved me just now!” I expect shouts and tears of happiness and joy (that’s what I am feeling) but all she says is, “Are you sure?” But I am not offended, because I AM sure. I have never been more sure of anything in my life. I am no longer “lost,” no longer on my way to Hell, but I have eternal life and am on my way to Heaven. I’m FOUND! By the way, the next day I ran into Connie Wynn, the first born-again Christian I ever met, who had been praying for me every day for five months, and when I told her I got saved, she did shout and cry and hug me, and we thanked God together that he saved me. Here I am, 41 years later. Jesus has been at my side all that time. Most days I feel like I haven’t accomplished much on his behalf, but I am grateful for all that he has done for me, and that I have the ability and opportunity to tell others about the God who loves everyone, each person, even though each one is a sinner who doesn’t deserve his love. And I can tell them that when Jesus died on the cross, it wasn’t just for me, it was for you, too. Here’s a link to the Google Maps Street View of the Brookfield Gospel Hall. I actually got married there. So how did phones work in the old days? Back in the dark ages of the 1970’s there was no such thing as a cell phone. There was no such thing as a wireless phone, either. In fact, there was no such thing as more than one phone company. Almost everywhere there was only AT&T, and the phones in your house belonged to them, not to you! That being said, in Connecticut our one phone company was the Southern New England Telephone Company instead, fondly known as S-N-E-T. The reason I bring this up is that because of this arrangement college students couldn’t afford phones. So in every dorm there was a pay phone down in the lobby. If you wanted to call someone you would call that phone and if someone happened to be walking by, they would answer it. You told them who you wanted to talk to and there was a PA system that they would use to page the person you wanted to speak to. Then that person would run downstairs and get on the phone. Anyway, back to my story to see why this is relevant. After the radio show was over (see previous post), I decide to take a shower. In those days a dormitory was just that, a bunch of double rooms with a communal bathroom and shower on each floor, not like the “suites” they have today. So I gather up my soap, shampoo, towel, etc., get in my robe, and proceed across the hall to the bathroom. I finish my shower and come out into the hallway, and I hear my name on the loudspeaker. I have a call on Sunday morning! So I run down the stairs in my bathrobe and get the phone. It’s my buddy Charlie from off campus. He got a call from my girlfriend asking him if he would pick me up and the both of us could go to Brookfield for their weekly Gospel meeting that night. Charlie was up for this since it actually gave him an excuse to drop me off and then go home so he could see his girlfriend. I had no idea where this day was going to end up. So, 41 years ago today, while driving a 60’s era Volvo sedan on route 84 outside of Plainville, Connecticut, I asked God to save me from my sin, and he did! I realized that Jesus Christ had died for me on the cross so my sins could be forgiven. I have been feeling nostalgic, so I am writing the story of how that all came to happen. I saw a piece of life in a pinball machine the other day. Cool! I love pinball! Before video games pinball was IT. I fancied myself quite the player, though not a pinball wizard. So I listen as he continues. I was on my last ball, and it was heading straight for the ball dump, and that would be it, game over. But I caught the ball just a little bit with one flipper, pushed it to the other flipper, hit the Special Target, and I won a whole new game. That’s what it’s like when you get Jesus in your life. Your life can be headed straight for the dumps, but get Jesus in your life, even just a little, and you get a whole new game. I was completely stunned. Here was some random guy on the radio talking about pinball and he relates it to Jesus. It turns out it was a Christian radio broadcast relayed from some place in Texas, and it aired every Sunday morning on our station. And it was exactly what I needed to hear, because my life was heading straight for the dumps, and I sure needed something. I had recently turned twenty years old, and my life had been going downhill for some time due to my own actions. This incident was the continuation of God’s efforts to get me to pay attention to eternity, and to consider the fate of my own soul.